Security labels are often used to detect tampering of containers and access points. It was used to seal glossy, laminated card，corona treated films and other printable surfaces. Seal your equipment with a rectangular tamper proof seal. These seals can cover vulnerable seams in your electronics and machinery to protect your warranties and prevent unnecessary tampering. When removed, these Partial transfers tamper evident security labels featured on this page transfer adhesive to the surface .It will leave a trace of “VOID” message on the surface to indicate that the seal has been broken and cannot be sealed back down without clear evidence of interference. 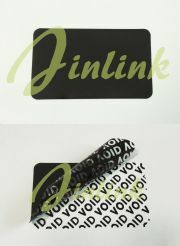 The void material is as standard available and custom security labels are also available. It can be printed with your own text, logo, numbering and bar codes. Our security labels feature superior tamper evident performance, which is designed to function within a short time of application on the recommended surfaces. Unlike competitive products, there is no long waiting period for the tamper evidence feature to be functional.